"I had a fantastic time and learned a vast amount about myself. I also learned a lot about developing my organization into a top tier company and look forward to seeing the future results. I would recommend it to great executives." "Fast paced, participative, highly enlightening." Corporate managers from across the U.S. have graduated from this program more confident, more productive and more effective leaders…driving their organizations forward. We start with a comprehensive assessment of your leadership style and the activities that drive you to succeed – this, before you even walk in the door. The result is a personal leadership profile that identifies the qualities and activities that energize you as a leader. By concentrating on key leadership competencies in the areas of communication, influence, and more, the Leadership Excellence Course teaches how these principles align with your personal profile for a customized approach to leadership. Every attendee leaves the course having created their Leadership Philosophy and with a 90-day Action Plan to apply newly learned skills in their professional life. Course participants continue developing their leadership skills with 90 days of post-classroom executive coaching. This ensures participants sustain change for ongoing improvement and receive timely feedback on challenges faced in the workplace. 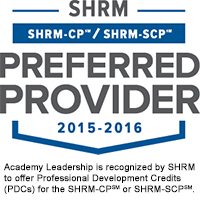 In addition to 36 PDUs from the Project Management Institute, attendees of our Leadership Excellence Course are eligible for 30 PDCs from the Society for Human Resource Management (SHRM), or 36 CPEs from the National Association of State Boards of Accountancy (NABSA).